Not a recipe exactly...but a darn good idea. 1. Lay out a few wontons at a time and leave the rest of the package covered to discourage drying out. Add about 1 to 2 teaspoons of filling to each wonton. Be careful not to over fill. Wet all edges of the wonton with water and seal, forming a triangle. 2. Heat oil to medium-high. Fry until browned on both sides. This is a very quick process -- about 15 seconds on each side, approximately. Drain on paper towels. Serve with a side of pizza sauce. 1. Heat oil to medium-high. 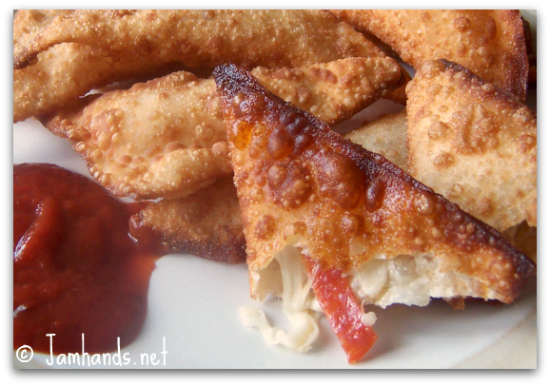 Fry wontons until browned on both sides. Drain on paper towels. Top with cheese, sauce and pepperoni. Microwave until melted and gooey. Recipe by me. Submitted for Made By You Monday. This is a wonderful idea. Fried wontons are absolutely lovely. I can just imagine the possibilities, the fillings inside! so you can join in as often as you like.